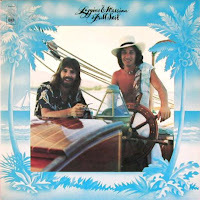 While Nate's been worrying about outfitting the boat, for me, embracing the life of a sailor means embracing Yacht Rock. The operative adjective defining yacht rock is "smooth". Whether smooth vocal stylings, smooth music, or smooth image you will find smooth-ness is all pervasive when it comes to yacht rock. As you can tell by the recent string of posts, our lives these days are consumed with outfitting the boat with gadgets large and small that will (hopefully) make our trip to Mexico safer and more enjoyable. Our latest addition is one that I'm particularly excited about. I've always been a closet environmentalist-- after all, I grew up in Boulder, Colorado which has a strong hippy vein running through its collective bloodstream. And, one of the greatest things I love about sailing is harnessing the natural power of the wind to move fast. Not to mention the obvious fact that wind doesn't cost a dime--we feel "sorry" (sic) for those anxious powerboaters watching the price of a barrel of oil-- after all, how could you relax while burning a gallon a minute? Given this predilection, our thinking was that if we added solar panels to Hurulu, we would be less reliant on our diesel engine for all the electrical needs...radio, radar, VHF, etc. We'd be able to sit back and enjoy our sunsets knowing that, somewhat ironically, the blazing sun was cooling our cocktails. So, the past few days have seen me spending an inordinate amount of time comparing obscure technical details... monocrystalline vs. polycrystalline, thin-film vs. traditional, fixed modules vs. flexible, etc. It's a bit like choosing a cell phone plan-- the range of options boggles the mind. Ultimately we pulled the trigger on a Kyocera 65 Watt panel. While it's not terribly large nor powerful, it didn't break the bank either, and we're hoping it will be enough to avoid running the diesel during those sunset cocktail hours-- and who can put a price on that? The boating world, you will find, is unusually rich with unusual characters. One such character is Bill. We have hired him to help us with some of the more technical tasks of getting the boat ready for cruising. He has been a God-send. I was introduced to him through the guy we bought our Monitor windvane from. But proving that the sailing world is indeed very small, I already knew him (sort of). It turns out I had met him, very briefly, five years ago in Cabo when I crewed during the 2003 Baja haha. Bill wasn't actually part of the race; instead, he single-handedly sailed a small plastic classic boat, shadowing some friends who were doing the rally. Afterwards, he sailed on to Hawaii, then back to the US, and then went down the coast again to South America. Having sailed that entire route solo, he had to be uber-prepared for all emergencies. He therefore has a keen eye for those systems and structures that might give trouble while at sea. Did I mention that on his last sail, while in Peru, he found himself an Incan wife? They now have a baby and are living on a friend's boat in Berkeley, which he sails over to Richardson's Bay. Together, they anchor out while he works on our boat. He is....a true "boat character!" I've been having sporadic flashes of panic as I realize how quickly the days are ticking off toward our October departure, while simultaneously, our list of to-dos is growing significantly longer. Take an inventory and create a spare parts list for our Yanmar 3GM30F diesel (shown above). Install our new Delta anchor on the bow roller, without dropping it overboard, and make sure it fits. I tackled the first two while Naomi took on the un-enviable task of cleaning the galley. To wipe down the walls of the fridge, she literally wedged her whole body into it, a process known as "boat yoga". We've also had help from a great guy named Bill to help us accomplish some of the more technical tasks, like troubleshooting the propane stove and possibly rigging up some solar panels. Bill is a rockstar...and a true "boat character". More on him in a future post. I recently read something to the effect of, "you can tell an experienced sailor apart from a novice by the size of his ground tackle." Ground tackle, in case you are not familiar, is a catch all term for anchors, rode, and other accoutrements such as a windlass and snubber. First up is the anchor. This is a vital piece of equipment for safety-- and for a good night's sleep. When we chartered a Jeanneau 34 in the Grenadines last May, I became vaguely obsessive-compulsive about dragging anchor, which basically means you are moving all over the mooring ground. I would wake up every hour or so and stick my head out of the forward V-berth hatch, convinced we were about to drift into some rocks or another boat. Will this be enough to help me sleep through the night? I'll report back, hopefully well-rested, in a couple months. To Bimini or Not To Bimini? 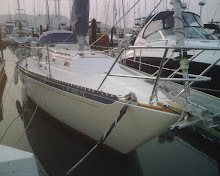 Living here in San Francisco, where it is cold all summer and foggy as much as it's not, it's hard to forecast our needs for shade when we take our Islander 36 "Hurulu" south this fall. We are debating on whether to get a custom Bimini made for the boat. This is a canvas and stainless steel tubing device (pronounced "BIH-mun-nee") that basically offers shade over the helm. Well, it never is with boats. The bimini must stand up to intense UV radiation without deteriorating. Thus, we get into the world of specialized canvas yardage, such as that from Sunbrella. Next, it needs to be able to stand up to 20+ knot winds but able to be taken down when the wind keeps rising past that. It also needs to avoid interfering with all the gear on board, such as winches, the radar tower, the outboard mount, etc. Add all these factors together, and it means that what would normally be a simple canvas awning on land is now a multiple boat-unit, super-engineered, high tech device. On second thought, how many tubes of SPF 50 sunscreen could we stuff into the bilge? Getting "Hurulu," our Islander 36, ready for the trip to Mexico is not a cheap process. We now refer to each incremental expense in terms of "boat units". 1 Boat Unit = $1000 in US$. Believe it or not, it makes it more palatable than if we were using actual figures for each piece of gear. It's like using a foreign currency...it feels a bit like Monopoly money, so that $9 cappuccino in Italy isn't quite so painful. The most recent addition was a Monitor Windvane self-steering system. This ingenious contraption of steel tubes and lines (http://www.selfsteer.com/windvanes101/index.php) uses the force of the wind against a vane and water motion over an auxiliary rudder to change the direction of the wheel, thus automatically steering the boat. We were told that if we tried to hand-steer for the entire trip, we would go mad. Thus, the price of sanity, in boat units, is approximately 2.6.